New edition for young readers ages 9 to 12, complete with riveting illustrations. 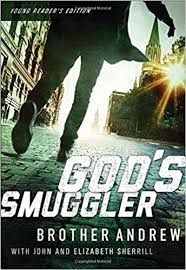 The exciting narrative follows the dangerous true-life mission of Brother Andrew, a Dutch factory worker who goes undercover to transport Bibles across closed borders. The courage of this young man will thrill a new generation of readers. They will meet one of the heroes of the faith--and discover the miraculous ways in which God provides for those who trust him.